Covering wildlife of Central India in a single tour package is a good idea. India Jungle Tours has very meticulously designed this tour package. Sunderbans, Pench Wildlife Sanctuary, Kanha National Park, Bandhavgarh National Park and Khajuraho Temple are the major highlights of this tour package. This tour package is very suitable for wildlife enthusiasts, students and experts of history and art, including general tourists. Not limiting itself to wildlife only, the package also covers the places of common interest, art and sculpture other than wildlife. Arrive Calcutta. Meeting & Greeting at Airport and transfer to the hotel. Overnight at hotel. After breakfast city tour of Kolkata visiting Victoria memorial, St Paulos Cathedral, Belur Math, Kalighat Temple, Pareshnath Jain Temple, Nakhoda Mosque, Birla Planetarium, the magnificent Indian Museum. Evening at leisure. Overnight at hotel. Drive to Basanti, for a boat safari in Sunderbans. The safari is conducted in this sanctuary by boat only and with stop at Watch Tower due to very dense forest and mangrove. Overnight at Lodge in Sunderbans. After breakfast transfer by boat to Basanti and drive to Calcutta airport to connect flight to Nagpur On arrival, transfer to the hotel. Overnight at hotel. After breakfast drive to Pench Wldlife sanctuary, now opened to the tourists. Afternoon jeep safari in the jungle. Overnight at hotel. 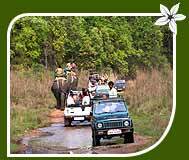 Morning and afternoon jeep/elephant safari (subject to availability) in Pench Forest. Overnight at hotel. Drive to Kanha National Park Afternoon jeep safari. The park is the only habitat of the rare hardground barasingha (Cervus Duvaceli Branderi). Kanha's easily spotted species are 3-striped palm squirrel, common langur monkey, jackal, wild pig, cheetal, barasingha and blackbuck. 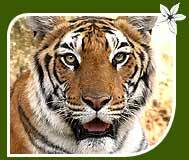 Less commonly seen are tiger, Indian hare, dhole or Indian wild dog and gaur. Rarely seen are Indian fox, sloth bear, striped hyena, jungle cat, leopard, mouse deer, nilgai (blue bull), rattel and porcupine. Very rarely seen are wolf, Indian pangolin, the smooth Indian otter and civet. Overnight at hotel. Morning and afternoon jungle safari. Overnight at hotel. Morning drive to Banhavgarh. On arrival transfer to hotel. Afternoon jungle safari. 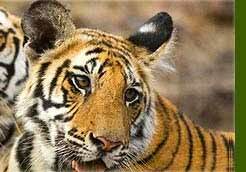 Bandhavgarh is a small National Park, compact, yet full of game. 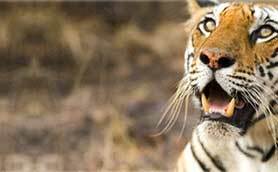 The density of the tiger population at Bandhavgarh is the highest known in India. This is also White Tiger country, which has been found in the old state of Rewa for many years. Bandhavgarh is densely populated with other species: the great gaur (or Indian bison), sambar and barking deer. Overnight at the hotel. Morning and afternoon jungle safari. 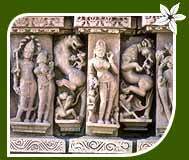 Drive to Khajuraho and on arrival, check-in at the hotel Afternoon visit 10th century Chandela temples. Overnight at hotel. Morning is free to relax. Later transfer to the airport to connect flight to Delhi. On arrival at Delhi transfer to International airport to connect onward flight.